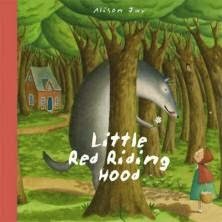 This is the story of Little Red Riding Hood. As far as versions of this classic fairytale go, this retelling doesn’t stray too far from the path. Like the girl herself, this tale strolls through the wood, is momentarily distracted by the wolf, and then continues on towards grandma’s house where trouble is waiting in the form of The Big Bad Wolf with his big ears, big eyes and big teeth. Little Red Riding Hood is saved by a brave woodcutter, Grandma is let out of the wardrobe and they all live happily ever after. However...Little Red Riding Hood does live in Fairytale Village. And it is here, according to the prologue, ‘where stories happen every day’. These stories happen in every picture, in every scene in this charming, engrossing picture book. If you look closely in the illustration where Little Red Riding Hood is picking flowers for Grandma (at the wolf’s suggestion) you may see Puss in Boots asleep up a tree while his boots rest at the foot of the trunk. You may see Hansel & Gretel in the distance, or the Three Billy Goats Gruff crossing a bridge. And many of these stories are continued on throughout the book. It is a treasure trove of characters for young children who know their fairytales. The Elves and the Shoemaker, The Enormous Turnip, Henny Penny, Jack and the Beanstalk, the Gingerbread Man and the Frog Prince are among those who make an appearance. A child could spend hours spotting and following different fairytales through this story. Jay’s illustrations are lovely. They are colourful and busy but not over-detailed. Despite the amount going on in each picture, the scenes are uncrowded and calm, allowing young children the space to easily see all the stories within. The crackled appearance of these illustrations makes them seem like old oil paintings. This is a picture book which blends the experience of pictures and text perfectly. And it gives young children who do not read yet the chance to ‘read’ their own story in the pages. It is a fantastically entertaining book.